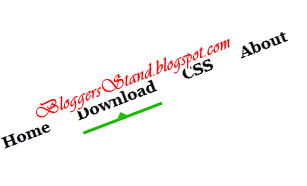 CSS Underline Hover Effect Navigation Menu Bar | BloggersStand ';-1!=b.indexOf("img.youtube.com")&&(a=' ');d=a+''+p+''+titlex+"
I'm going to explain how to add CSS Underline Hover Effect navigation menu bar for Blogger.This Underline navigation menu bar is compatible with all browsers like IE10,Chrome,Safari,Firefrox etc.To add this Search Box Style CSS3 Navigation menu bar widget gadget for blogger website just follow the steps mentioned below. 3. Now Click EDIT HTML Button"
Underline CSS Hover Effect Navigation Menu Bar for blogger blgospot,best navigation menu bar for website with underline hover effect green colour bar simple and clean menu. 0 Comments on "CSS Underline Hover Effect Navigation Menu Bar" So Far - Post Yours!